The Sony PDW-850 XDCAM HD422 2/3" 3CCD Camera features an ENG-style shoulder mount design for use in the field and has CCU control and a "pool feed" video input for studio applications. Recording to the XDCAM professional disc format, the camera records in MPEG HD422, a broadcast-spec 50 Mb/s codec with 4:2:2 color sampling. The camera can also record in MPEG HD420 for longer recording times and can record legacy standard definition video in DVCAM or MPEG IMX. It features a standard 2/3" B4 lens mount. A viewfinder and batteries or power source are all available separately. The 1920 x 1080 native picture is achieved thanks to three PowerHAD FX IT CCDs. The three-chip design splits up color into its three RGB components, thereby avoiding the interpolation and potential loss of detail on most single-chip designs. The camera can record at multiple frame rates up to 60p, including PAL area frame rates (50p/25p) and several 24p implementations. Built-in GPS means location data can be included in the video metadata for reference later. A USB port allows for proxy files to be saved to an external storage device, saving scene data so a specific look can be recycled later. The port is also used for firmware updates and for connecting the optional CBK-WA100 wireless adapter for remote operation and proxy file transfer. Because the XDCAM media supports random access, it is possible to jump almost instantly to any clip selected from the thumbnail menu. At the same time, the format provides a professional grade media designed specifically for video recording to provide the same confidence one has when using a tape format. The camera supports both the PFD50DLA and PFD23A professional discs for up to 95 minutes of recording in the highest quality. Improved from the previous generation, the sensor features lower noise while keeping high sensitivity and wide dynamic range. The signal-to-noise ratio has been improved from 59 to 62 dB, while maintaining a high sensitivity of f/11 at 60i. Note: ALAC cannot completely correct all lens aberration issues. Longitudinal chromatic aberration cannot be completely eliminated. The PDW-850 is capable of 50 or 60 Hz production, enabling users to create content for clients globally. The 4x digital extender gives you a quick way to zero in focus to a specific area of the frame. Operation of the digital extender can be assigned to an assignable button and can be 2x, 4x, or 6x. As with digital zoom, loss of detail will occur the more the image is magnified. The body-side color LCD panel features a higher resolution that on the previous model. It is a transmissive-type panel with 960 x 540 (RGB) effective pixels. The panel allows for viewing of video, thumbnails, and menu characters in more detail. Unlike the PDW-700/F800, the sub-panel has been eliminated and the same information is now displayed on the color LCD panel during power-on. The HD-SDI, SD-SDI, and composite inputs are now a standard. For composite video input, the PDW-850 utilizes the genlock input connector. 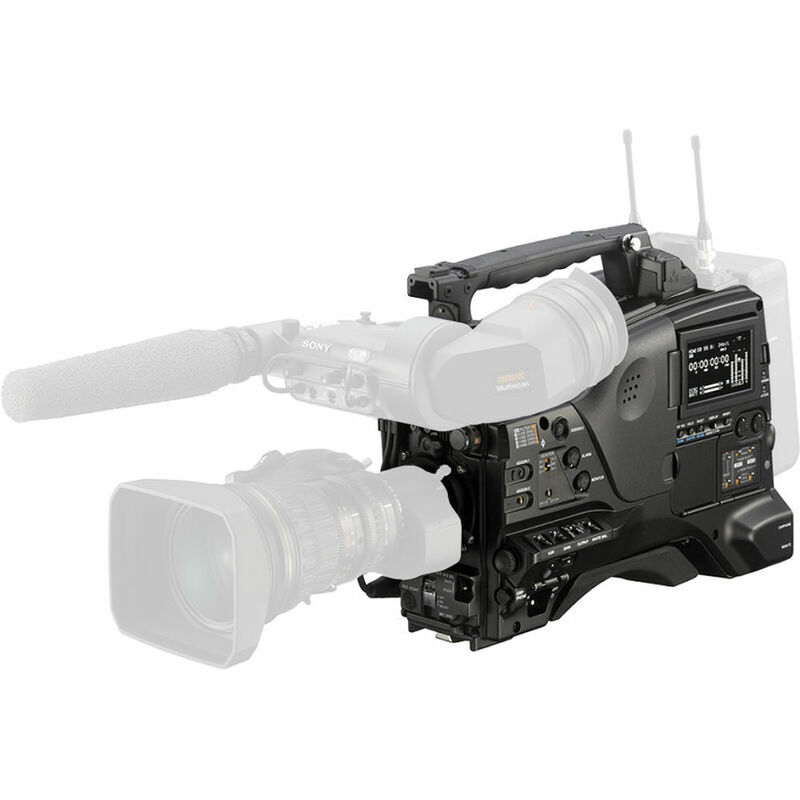 In addition to HD-Y input for return video, the PDW-850 can accept 1080/720 HD-SDI for return video. This is available via the assignable switch in EE or REC modes. HD-SDI return can be monitored through the viewfinder (available separately) and on the LCD panel. The 4-pin DC output for audio accessories has been increased from 0.5 to 1.0A. There is also a D-Tap output for lights, monitors, or other peripherals up to 50W. The GPS module is mounted in the camcorders handle while GPS data is displayed on the side LCD panel. The GPS data can be shown during playback as well and can be turned on or off with a menu setting (the default is OFF). Note: If a disc with GPs data is ingested into PDW-U1/U2, the firmware (VFAM) version must be v5.1 or higher. In addition, "All File," "Scene File," "Lens File," "Reference File," and "User File" data can be saved or loaded from a USB flash drive or other USB storage device. The location of the USB connector has been moved from the handle to the right rear panel for easier connection of the wireless adapter. Note: There is a per-file recording capacity limit of 4GB. You can record several files onto one recording device as long as any single file does not exceed the 4GB limit. The PDW-850 can be integrated into a studio setting thanks to its standard 50-pin interface, which is compatible with the CA-FB70 optical fiber or CA-TX 70 digital triax camera adapter and related CCU's. Note: Some features are limited when using with CA/CCU. Please see the operation manual for a complete list of supported features. PsF formats (23.98, 25, 29.97) are not supported in studio configuration. Box Dimensions (LxWxH) 17.5 x 14.0 x 11.0"